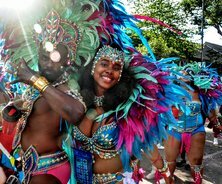 Carnival Village Trust’s subsidiary, Notting Hill Carnival Ltd (NHCL), the official organiser of Carnival 2018, which takes place across the August Bank Holiday weekend, has vowed to make the event the most successful, safe and spectacular to date. Supported by the GLA, Notting Hill Carnival Ltd plans to reintroduce stewards recruited locally to work as part of the McKenzie-Arnold operation in liaison with the Metropolitan Police. The company sees the stewards serving to enhance visitors’ experience through their Notting Hill nous and understanding of Carnival. Talking to press and friends of the event in the very busy, very hot Tabernacle, Powis Square on Thursday evening, Matthew Phillip, NHCL’s Executive Director, highlighted Carnival history as a cornerstone for its future. In fact, Carnival is a thriving, vibrant weekend where up to 2m people come together to participate or spectate, but while the numbers have grown Phillip was quick to highlight its traditions and dismiss those seeking to wrest the event from its roots. “I’m very proud to say Carnival is still organised by the community, many of whom volunteer their time throughout the year to make sure it gets to the people,” Phillip said. The launch featured performance from the Endurance Steel Orchestra, dance and spectacular costumes and Philip hailed the fact that Carnival arts continue at the heart of the event. Panorama, the steel band competition, will be in the same Powis Square location with a new configuration allowing more of the audience to get a first hand experience of the performances. The Powis Square Stage will host calypso performances as well as local acts on the Sunday, which will be mostly children and young people. On Monday, the Wilf Walker Community Stage, in the same location, named after the man who introduced live stages to Carnival in 1979, will also feature bands/performers from the area. “We are committed to delivering a Carnival that cherishes and shouts about its heritage while at the same time serving as a vehicle for changing times,” Phillip said. Reeling off a list of agencies that make Carnival possible, Phillip finished his speech as passionately as he had started it. “Notting Hill Carnival is a unique experience, a much loved event and absolute survivor that we should all be proud of,” he said. "And it’s in safe hands."